The nurse laughed, looking at me holding my newborn baby with a book at my bedside, "It'll be years before you get to read one of those again!" Challenge Accepted! Repost: This past week I sent out a prayer letter to all of our prayer challenge team to pray this week because I am feeling extremely overwhelmed. There is no time to sit down and write a wonderful blog post about it, but I will soon. Until then I thought it would be useful to others to have access to the resources I return to over and over when I am overwhelmed. I dug up this old blog post for myself, and figured I would repost it for you. Yes, the links are associate links with Amazon. It will cost you nothing to click through. If you do decide to purchase anything I will get a small percentage of that money with no extra cost to you. I have often struggled with the verse, “Love your neighbor as yourself” (Mark 12:31), thinking that it would be insulting to my neighbor if I was to love her as I love myself. I have always thought negatively about myself, even in elementary school, believing I was far bigger than others, hairier, louder, and something was wrong with me. The last few years have truly turned me around, and now I truly do see that I must learn to love myself in order to love those around me. God has commanded that I love my neighbor as myself and I would very much like to love on my neighbor, which means I must elevate the love I have for myself. I must stop denying God in His outspoken love for me. I must heal and learn to belong in my skin if I am to love others properly. Today I give myself permission to take better care of myself. I will learn to believe that I am enough, that I have worth, and that I am valuable. Every day I will attempt to say no to something in order to take time for caring for myself. When I sit down with chores and tasks and schedules, I will make sure to add things I enjoy like writing and reading and exercise. I will continue to get to know myself, my potential, my dreams, and my goals for the future. I will continue to walk toward God and learn His Will. In all of these steps, in prayer and meditation, and in practicing kindness toward myself, I will truly Belong. My happiness will be a positive light in the lives of my family and friends and all around me, making it worth the journey. I will receive a small bit of the money if you click through the links on this page to purchase these books from Amazon, with no extra cost to you. How awesome is that? I am currently reading the book, The Fringe Hours, by Jessica Turner. Throughout the book there are various writing prompts, so I decided to share this response to one of them. In my quest to learn to love myself this year I knew that books would hold many a key to unlocking the doors and windows in myself. This book has indeed begun to do just that with only a quarter of it read. I am taking my time as I read through it so that the truths of God’s love for me, and my need to love myself in order to pass that love onward, can seep into me. I love reading books with meaning just as much as I love reading books to escape. However, to read a book that will change my life takes many more days than cozy mysteries and adventure novels. Once I finish a book that takes me on a journey through myself, changes a habit or attitude of mine, it is very challenging to share that personal testimony with others. Therefore, many of the most important books get no more than a mere recommendation in passing from me, if that. This is why I thought recommending this book at the beginning of that journey would be successful. Let me recommend some more books that have been instrumental in my life over the past year or so. I thought I would include links to past reviews that relate to this category as well, so below the new reviews I have included pictures of previous books which you can click on to find my review of that book. The Highly Sensitive Person, by Elaine N. Aron, Ph.D. was a game changer for me. Finding out there is a whole community of fellow “barometers” (someone who can sense others’ emotions, and is vastly affected by the mood of a room) as my mom always called me, was thrilling! This book taught me so many things about myself that I have now been able to accept rather than work to change. I recommend it for anyone struggling as I was to live in a sandpaper world. One More Step was instrumental in my moving into this season with joy. I was concerned for the year of waiting for Kyrie to get surgery that only in her healing would I find peace and joy. I learned through all of these books, and it was cemented through this book, that I can find joy in the pain, I can begin to heal even before I can find any solutions. I finished this book sitting in Cyprus watching these birds, and that image is one I return to over and over when I am feeling low. I was able to sit in my pain and feel God’s Presence and hear his voice promising a future. Like Abraham I was able to take one more step each day, to rise early, to obey, without any confirmation of the promise. This book was the one at the beginning of this season of Abraham I feel that I am currently in, so it sits in my memory as a huge book in my year. This book required a contract between myself and God, and I return to that piece of paper almost every other week to remember the promises, and to seek one more step of obedience to God. If you are in the in between of seasons, a time of struggle or transition or trial, this is the book for you. If you are feeling weaker and weaker instead of stronger, read this book before you give in to the exhaustion. I cried every chapter of Undone. This beautiful memoir by Michele Cushatt softened my heart in so many ways. It gave me the courage to keep going through the trials of waiting for Kyrie’s surgery and watching her in pain all the time. Truly, it was life altering to join with Michele in her story through her beautiful writing. All of Sarah Young’s devotionals have been wonderful for me to grab for a quiet time of prayer and meditation. I so appreciate her gentle way with words and the practice of taking a verse and treating it as straight from the mouth of God as well as something to respond to. She truly makes it safe and easy to be in conversation with God, to pray always as we are called to do. Dear Jesus is one of my favorites because it starts with the place of vulnerability which I really needed the past two years. This is only the beginning of the original post because I only included the books that I think would aid me in this time of being overwhelmed. There are plenty of other books that have helped me, and as I work through this season, hopefully I will be able to start sharing some more awesome books I have been reading. Please share any books that have helped you in seasons of overwhelm. And thank you for purchasing through my links, this is my first Amazon Associate post, and I appreciate the support. This is Day 8 of my FREE 21 Day Writing Challenge. It isn’t too late to Join the Challenge! Yesterday Louis and I went out to a hockey game and I completely forgot about it, so I didn’t get a chance to write. I am learning through this challenge about writing during times of great flex. I feel most relaxed to write well at night, but I need to prepare ahead of time to make the time to write late at night. This book is such a good book. When it first came out I was so excited to read it, but forced myself to wait until the month I had it in our budget to purchase a book online. I LOVED the book. The whole purpose is to look at success and to take apart the ideas that we hold to of there being these excellent people who come from nothing and have no help along the way. The book is excellent and worth reading, and in this short post I won’t be able to do it justice. For me it was wonderful to look at the different aspects of making excellence in the multiple case studies he shares about. The writing style is so easy to read and makes the statistics understandable while not sacrificing the numbers and purpse of data. I truly believe Louis, my husband, is meant to be great. So, for me reading this book was also helpful in looking at his life and how to support him. One of the main points the book makes about greatness is that it takes about 10,000 hours of real practice to become an expert at something. I began to think about what Louis spends hours and hours doing. Theological application is one that came to mind. Even before he became a Christian, my husband was thinking through those ethical dilemnas and working out religious problems. People is another one of Louis’ expertises. He has spent years studying the people around him. Malcolm Gladwell explains that to hit that 10,000 hours takes about 10 years, which is how Louis can be so good at these things at a young age. As I said I can’t explain it all in this short post, but you should read the book for sure because it was an excellent and important book. As I am moving into the New Year and making goals and plans, I want to become a better me. I have great aspirations for creating a life for myself of independence and purpose. I want to move forward with focus and intentionality. I want to belong in my own skin. I want to love myself and learn to be happy. As I read Outliers I also spent time thinking about my own expertise. I have spent at least 10,000 hours reading. I was thinking about this and getting down on myself for not being better at English. But it occurred to me, that like the post earlier about never throwing out an idea, I have a vast web of connections through reading. I have learned about people, the way people think, and now use those ideas in my own writing. I was able to look at a lot of things analytically through this book. The book taught me to read between the lines in any story of someone rising to greatness in order to see the help actually received along the way. No one can do it on their own. We all need community as well as passion. So exciting to think about. As you have seen, I am working through my very own FREE 21 Day Writing Challenge. The only way to get the prompts so you can join is to CLICK HERE! Sunday is a Skinnied down version of the Challenge, so today I am going to link to some past posts that you may be interested in. The first post I am linking to is my review of an excellent prayer journal book I read this past year. If you are following the Challenge, or if you are inspired by my own following to start a spiritual journal, read my review of How To Keep A Spiritual Journal. Secondly, as the New Year comes up and you begin making resolutions, make Bible reading one of those resolutions. CLICK HERE for my own How To Make Your Own Bible Reading Plan. Finally, let me take you over to my page of resources for creating New Years Resolutions or just lifestyle goals. CLICK HERE to get access to these FREE Resources. I know that I will always have something I can improve about myself. I spend a lot of time trying to improve and work toward who I want to be. In doing my Reading Challenge for the year, I have read even more books than normally that have aided me in changing my attitude, marriage, lifestyle, habits, and even accepting who I am so I don’t have to manically run after improvements. As I was looking back over the books I have read this year I was realizing that I have kept a lot of these books close to the chest because I learned some very personal things and I am not quite ready to share everything I have learned and am trying to implement in my life. I am not ready to shed all my layers and be completely naked before you all on the internet, even though I try hard to be very vulnerable on this blog. If I do not believe in the help offered by a book, I won’t finish it. In the self-help category I start out pretty skeptical. Yet, this year I have already read 15 books that I would put in this category, and I loved the majority of them. Finding those 15, however, took starting and qutting quite a few others. Because of this I figured it might be helpful to some of you out there who are tired of trying to weed through books with your own busy schedules if I could share what made these books stand out amidst the others of their type. Additionally, I want to provide a starting point for you if you are looking for something in your own life. Self-help is very specific, and the idea of having a book be the answer is pretty ridiculous, but when we are living an open and honest life with ourselves we can usually find a book that can be of great help in walking us through and processing with us a specific area of life that we need in a certain season. To begin with this review I will take you back to 2015. Last year I read a marriage book of his that absolutely changed my marriage. I have never finished a marriage book prior to This Momentary Marriage. As a young person getting married, I definitely feel like my marriage is different than anyone else’s I observed growing up. We tell each other everything, and we are honest with each other. We don’t need these books that talk about such normal issues. We will never argue about those things, or if we do we will argue and solve it. Those things that wreck other people’s marriages are just because they are missing the love we have. Well, this book didn’t even try to tell me what a normal marriage book would talk about. In the very beginning of this book, John Piper shares a letter from Dietrich Bonhoeffer to his fiancée while he was in prison in Germany for attempting to assassinate Hitler. The beginning of this book was very clear: Jesus Christ is the most important thing. End of story. This will wreck your life if you let it. I cannot say enough good things about this book and the way it made me see my marriage with God’s eyes instead of my own. This book was nothing like the other marriage books out there. It doesn’t approach marriage at all like other people and books. Not only did it help me take off all those blinders and rose colored glasses and blindfolds I had put on to keep from seeing my marriage as normal, it raised my expectations and standards for myself way higher. This is a must read for anyone in the world who has a heart that might love ever. CLICK HERE to read my full review of This Momentary Marriage: A Parable of Permanence. When this year began I was depressed and just couldn’t climb out of it. I was so sad all the time, and just felt lost. I knew that I wasn’t grieving in a healthy way, and I knew that I needed to let myself grieve and be sad for things I had never grieved. So, I took the time to walk through a book called A Time to Grieve. The book worked well for me in two ways. First, I was able to grieve with the questions and process. I took extra time to journal as much as I could about the questions presented and really take time to be sad. The book is written for people who want to help others grieve, so I was also able to take a step back and think about others. How I could take my own pain and grieving and become more empathetic. For me this was a huge deal because I do not have a great deal of empathy stored up in myself. I would recommend this book for anyone seeking to comfort others, to learn more about the grieving process in a way that is not formulaic. The book is written in more of a relational way than a step by step definition of the grief process, which I really enjoyed. Because I loved the John Piper book so much last year, I decided to read another one this year. Piper is known for his book Desiring God which is what his website domain is as well. I meant to read that one, I really did, but at the beginning of this year I just wasn’t desiring God. I was mad and depressed and in culture shock and grief stricken. As I was looking at Desiring God, I found a follow up he had written called When I Don’t Desire God: How to Fight for Joy. That sounded a lot more like where I was at. But then I found a third follow up. John Piper took the last chapter in When I Don’t Desire God, and made it into a book, When the Darkness Will Not Lift. That was perfect. This book was amazing at letting me be depressed. I really was able to just sit before God and grieve and be sad for days and months. When the healing came it was not fast and it was not pleasant, but I was able to sit in the promises of God that He will not put me to shame, and that He is my refuge. In the middle of the darkness, He is my refuge. In the middle of depression, He is my comfort. Even when I don’t feel comforted, He is my Tower. If you or someone you know is in the darkness, this book is powerful and excellent. If you are just struggling to find joy, I would recommend any of these three books. Even without having read the first two, I know they are excellent books. More Self-Help Book Reviews on their way! CLICK HERE to receive updates in your email so you can be ready to get the next installment of Helping Yourself to great Self Help Books. Why I Unplugged for Two Months! Besides the 1 Samuel Blog Bible Study, I haven’t posted since June 16th! That post was about the amazing book I read 21 Days to a More Disciplined Life by one of my favorite bloggers, Crystal Paine. So, why did I stop posting anything but Bible? I took the past two months to cleanse my brain and focus my energy into preparing for a new season of discipline. A Life edit as prescribed on day 15 of the 21 Days. It was lifegiving to simplify my life in this way. When we began the summer, Louis and I sat down with the calendar and looked at the whole summer. We knew it was going to be hard with teams to organize, interns coming, preparing to send Davy to school, and visa trips. We would sit again at the beginning of each month to plan out the month. We felt prepared at the end of each of those meetings together. But then almost every week I was past done. I was frustrated with my feeling of weakness. I felt wiped out. I wanted to quit. I can’t make it! I would shout to the heavens. I wanted to take back all of that planning we had done. I wanted to give up on nearly every responsibility and relationship I have going in my life right now. I just couldn’t live up to it all! Simultaneously, I felt God calling me deeper with Him, into waters that would involve even more discipline. “God, don’t You see how I am failing at this discipline thing? How can you expect me to do what You are telling me to do? I can’t even do the simplest part of this plan!” I exclaimed. I felt like I was falling on my face before Him, being vulnerable, giving Him my weakness. His response was not what I expected. Instead, I heard God say, “Child, you are a Princess. You are an heir to my kingdom. That means there is work to be done. I am here with you, and I will equip you.” Words that I have heard many people share in testimonies for years. Words that have always sounded good when they were for someone else. But to hear them meant for me… Well, now they were real words. And I didn’t like them. I didn’t want God to step in beside me and help me out. I didn’t want to keep going. I wanted to stop and rest and have bonbons! (Still don’t know what a bonbon is, but isn’t that the highlight of being a stay at home mom?!) God coming and giving me strength meant I had to keep going. Like the Israelites complaining about food and water, it turned out the food and water wasn’t what I wanted. I wanted an excuse to return to everything being exactly the same every day, even if it meant I was a slave. Well, realizing something like that about myself made me want to change my heart, so I have taken the last two months to adjust my attitude. I was convicted. So I stopped and had a heart restart. I have gone through the steps from the 21 More Days to a Disciplined Life ebook several times, and one of the sessions I made my goal a new attitude, then taking a page from One More Step (book review coming) and life with Louis Liss, I prayed even bigger. I prayed for happiness. Happiness in the midst of the chaos and weakness and failure. It was a big prayer, but if God is going to get me through the giant tasks He is calling me into, I believe He can heal this other part of me that refuses to be happy, too. Even with a clean house, well-behaved kids, and my husband doing everything I ask, I will NOT have PEACE if I am not doing what God has called me to do. I return to this blog a new person. I have had reconciliation, purpose, and happiness reignited in my life. Actually the happiness part might be brand new in my life since childhood! So, I am happy to share with you that I am moving forward renewed! This last picture is a selfie we took on our most recent visa trip. It captures us in this season, imperfect, but happy to be a family surrounded by God’s work (in this picture the ocean, which Kyrie couldn’t look away from for every selfie we tried). Happy to have wonderful people like you out there who pray for us and love us. Happy to be on God’s path, the safest and most secure path available. Look forward to some new posts coming in the weeks ahead. Posts about life in Lebanon, how the summer has gone, parenting, books I have been reading, and more! PLUS, join us in our fundraiser for Kyrie’s surgery in December. Author Annie LissPosted on August 17, 2016 August 17, 2016 Categories Spiritual LifeTags books, Kyrie, Surgery FundraiserLeave a comment on Why I Unplugged for Two Months! This is going to be a short post that will begin my weekly goal posts. I am going to post Mondays, and the goals will not include the weekends so that I have more slack to review my goals from the previous week. I just completed the course Make Over Your Mornings by Crystal Paine, one of my favorite bloggers. Much of the method to my goal setting comes from this course. I cannot place a measurement on Thriving, but by choosing the following measurable goals, I believe, day by day we will begin to thrive. If you want to see my past posts on Goal Setting CLICK HERE. My Goal is to Attempt Avid Reader this year, which is to read a book approximately every 2 weeks from the challenge list. This is audacious, but I think will help my soul and heart to attain the rhythm God and Louis are both impressing on my heart in this season of life. After finding the reading challenge mentioned above, Louis and I both have set reading goals, which will come from that challenge instead of add to that list. Spend Intentional Time Together Just for Us 3x per Week. Many of the goals for this year are not truly Big Goals for the year, but just building routines. At the end of the year I want to be able to look back and see several things accomplished however. Pause for PRAISE here for our evening routine at bedtime working so well and continuing to include Bible Reading to the kids! Arabic Study Plan: Study 1 hour per day. 20-30 min. per day for Davy. The Arabic Study Plan of course is part of our ministry here, and once that plan is in place it will cover many of these categories. Mommy Book Blog: Post Weekly Goals once a week for accountability and twice a month posts on books and parenting and life in Lebanon. Lisses to Lebanon Blog: Post twice a month. Hopefully one from each of us each month about missionary life and ministry. In the past I made many mini goals, but these BIG GOALS will be broken into bite size (weekly) pieces and posted each Monday in Weekly Goals. Feel free to post your own goals so we can all keep each other accountable. I had no expectations with this book beyond its being a Cozy Mystery. 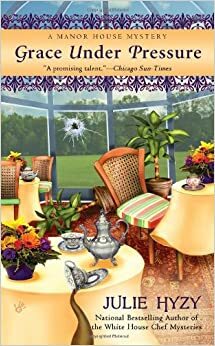 Julie Hyzy was a name that was new to me, and I had not heard of her other series either, the White House Chef Mysteries. One of the keys to a Cozy Mystery is that there is a hobby or profession of the main character that usually does not lend itself to being involved in crime solving and detective work. I tend to read those Cozies that share in my own hobbies and interests, so this book was a step outside of my normal range of Cozy reading. Grace, the main character, is a curator for a manor. I think when I was creating my wishlist at the library I was trying to find Cozies with librarians, and the organization of that type of administration led to several museum related Cozies. This book is about an old manor that has been turned into a museum and hotel. The main character, through Hyzy’s writing, truly did draw me in to love her job and location. I left the book wanting to visit this place and meet her, and several days later was still thinking about that idea. It was sad each time for my brain to catch up with my dreaming and realize that she is not real. This book had several characters and writing choices that might cause discomfort to some readers in continuing the series. The roommates of Grace are gay, and there was some swearing, but it was always immediately cut off by some interruption after only the first letter. I mention these points because I have found myself reading a Cozy or two in the past that I feel duty-ridden to try to get past similar minor discomforts, but after finishing the book realized that I should not be feeling guilty. There are so many books in the Mystery section that are not for me, and I don’t need to read an entire series trying to get past some quirk of a character that I can’t stand when there are other books with characters I fall in love with, as I did with this book. In fact, as soon as I got to the library the next time, I scooped up every book Hyzy had. For me, these two things were nothing, but I want to be transparent in my review since I am recommending the first book in a series. Julie has me reading her books now, and I highly recommend them. The setting was modern day, but brought into play the way that manors used to be run, and that was wonderful for me. I realized reading it that this is something I do enjoy, and often think I can only find in British Literature. It was wonderful to have an American setting that shared some history. I also loved that the romance did not come rushing on strong in the first book. It is expected that the main character, usually female, in a Cozy Mystery will have at least two men pursuing her, and a bad relationship in her past. It was nice to not push all of that into this first book. Having male characters around that were plutonic and gay actually was relieving because it is nice to have friends. The romantic story had some tension placed, but it was not rushed. Finally, there are conversations with women that are not merely about relationships, which in film passes the Bechdel Test. I loved that. The characters were full and gave me excitement to learn more about not just the main characters, but also the side characters that were introduced. The twists in the story did not all get resolved with the resolution of the murder, so there is also that excitement to look forward to in future books. I am also going to read the White House Chef Mysteries, so stay tuned for a review on that series. If you want to take a jaunt through a modern day time machine, this is your book. The facts about the book. Davy’s First Year of School! Mommy Book Blog Powered by WordPress.com.